Dumping raw herring chunks onto an existing conveyor. 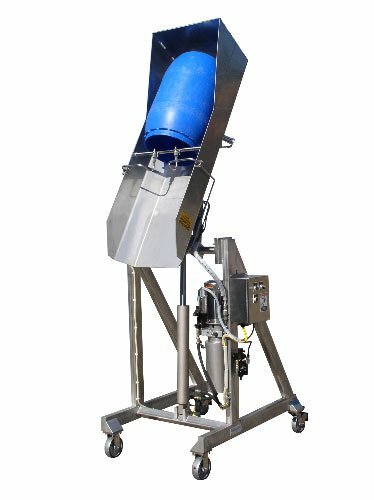 54″ dump height, 60° discharge angle. 304 stainless steel structure with continuous, passivated welds. 316 stainless steel product contact surfaces with welds polished smooth. Loading skip has a bottom with drain holes to accept drum at floor level. Skip includes dual drum impactor to help remove non-free flowing material from the inside of drum walls. Twin high-pressure water spray nozzles rinse the drum interior in the full discharge position. Four-bolt, corrosion resistant, nickel-plated, piloted flange bearings on pivot. Stainless steel hydraulic lines and fittings. Totally self contained 1 GPM double acting hydraulic system. Stainless steel washdown duty motor. Includes timer relay to prevent jogging of the controls.